That was the exact reaction that our group had once we got back from Naukuchiatal. A beautiful place with a lovely resort, overlooking the lake... starting from the scenic beauty enroute from the station at Kathgodam to the resort till the excitement of paragliding, it kept us all enthralled and thankful that despite all the difficulties and delays we made it here. 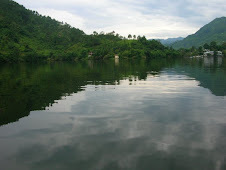 Initially confused as to the best place to stay, we realized we had made the best choice by staying at The Lake Resort. The view from there, may it be the rooms or outside, is unparalleled, the pristine blue sky being reflected in the depths of the lake i would say, trees and mountains surrounding the place. The best aspect was that it was very simple and it was nature that added to the beauty of the place rather than artificial or superficial add ons such as in other certain places. May it be ginger teas or the inane number of hot water flasks (which made up for the absence of electric kettles) we ordered or the very hospitable and on their feet service and the really yummy food which has surely increased our weights by a couple of kilograms if not more, the will to keep the guest pleased came across very strongly. The resort is the best place to relax and enjoy the sun along with the breeze from the lake and the crickets actually going on the whole day. May it be us sitting chatting there the whole day or a friend enjoying reading a novel, or a couple sitting in one corner sharing their thoughts or one just enjoying their kind of music, and one busy clicking photographs, we all enjoyed it in our way. A walk around the lake, some horse riding and boating back from one end of the lake to resort was the only thing that ensured we would be able to eat after a massive lunch. Being a boisterous group of 11, we enjoyed a great bonfire evening followed by dinner. The fact that we were carrying our own music system made it more fun. and then just sitting in front of the lake again.. seeing the clear sky with the stars actually made us sing twinkle twinkle.. for the stars looked no less than diamonds.. a couple of constellations and shooting stars wrapped up the beauty of the night. Just a couple of pointers being the evenings are very chilly, it being end of October, we were literally wishing for the sun to come thaw us out. Also. make sure you have your taxi services sorted before you reach the resort, because arranging for a taxi at a nominal rate from up there is very difficult. The area per se has no activity except for boating and walks, but we enjoyed some table tennis competitions. The next day saw us heading off for some adventure in the form of paragliding. Was it fun or what, if not for the excitement, palpitation or adventure of it then try it for the height, freedom and the amazing view of the whole place. 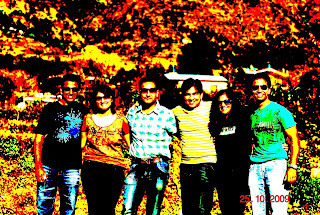 We further headed to Bhimtal to catch the canoeing n kayaking competition happening there, but missed it by some hours. Considering thats all the time we had, we didnt get a chance to explore other areas around, but would love to go back and do that some day. A PLACE TO BOND.. WITH YOURSELF AND WITH THOSE YOU LOVE. Shalika is a lawyer by profession.